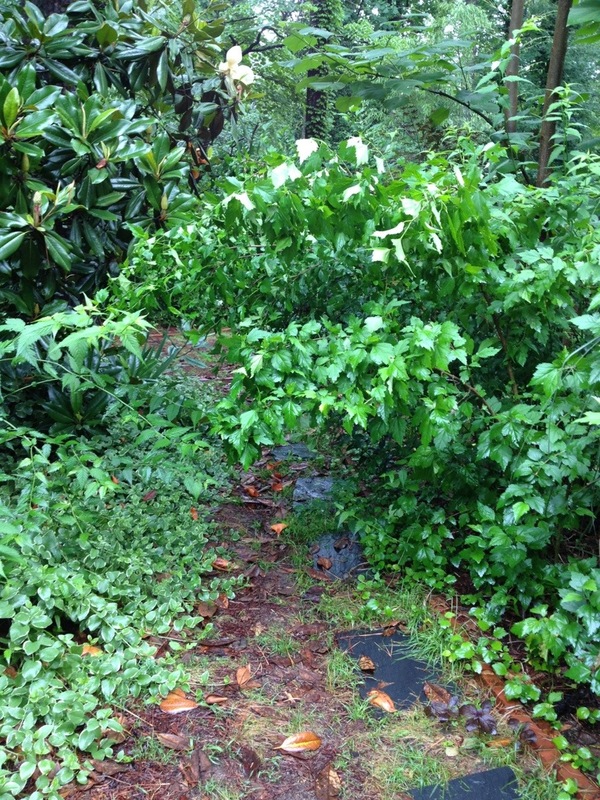 After tropical storm Andrea… | Arthur in the Garden. Tropical storm Andrea pass through the area Friday. She left more than 5 inches of rain and downed trees and flooded lowland areas. The power flickered but did not go out in my neighborhood. As I arrived home from work about 6:30 pm I pulled slowly up the drive expecting to see many limbs in the yard. There was only one dead pine limb about 5 feet in length in yard. I was relieved. As I arrived near the end of the drive, next to the house, I see the rose of sharon Altheas were not as lucky. They were all leaning over. They usually stretch toward the sky with long and thin limbs which heavy winds or rains often bend to the ground. They will often pull themselves back up over several weeks. If not, they will get a hard trim back to up right wood. 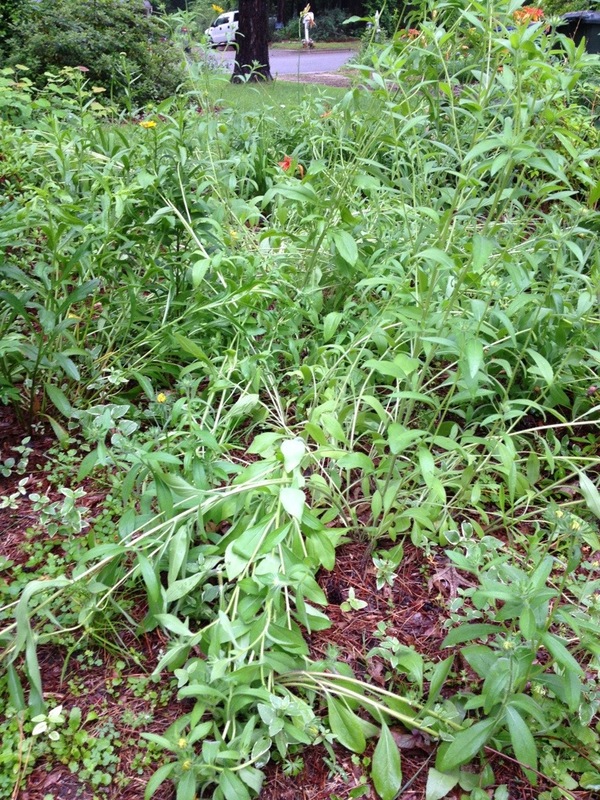 The patch of Black-eyed Susans were hit hard, too! Along the street, many plants were leaning but survived. 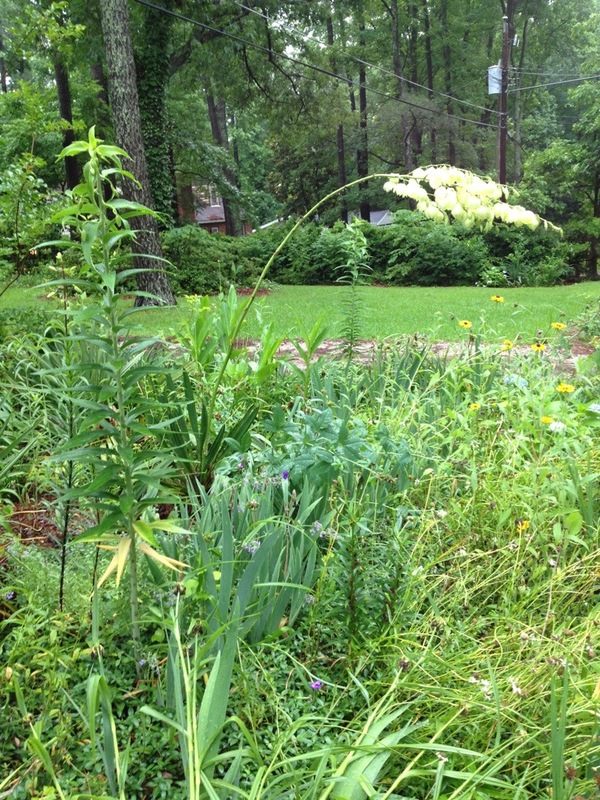 And the yucca near the mailbox garden now has a leaning flower spike! 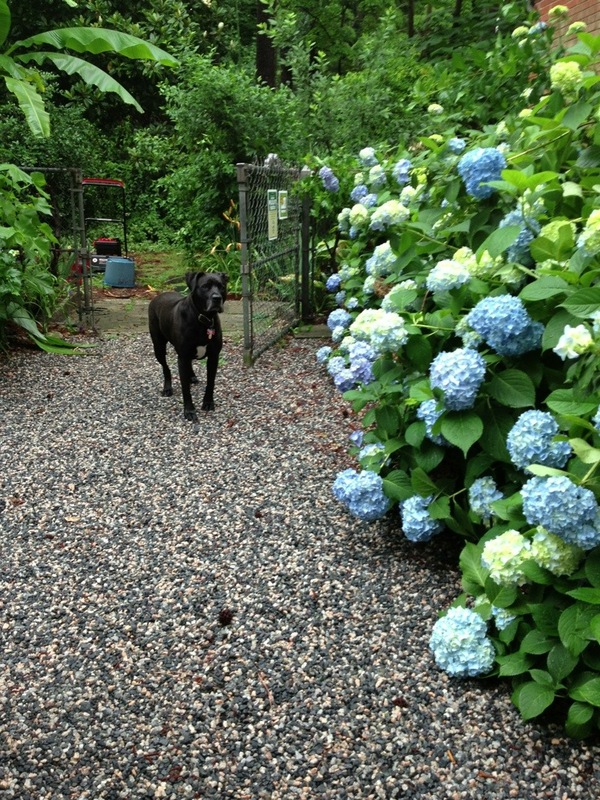 The hydrangeas along the parking area made it through the wind and rain mostly unscathed. 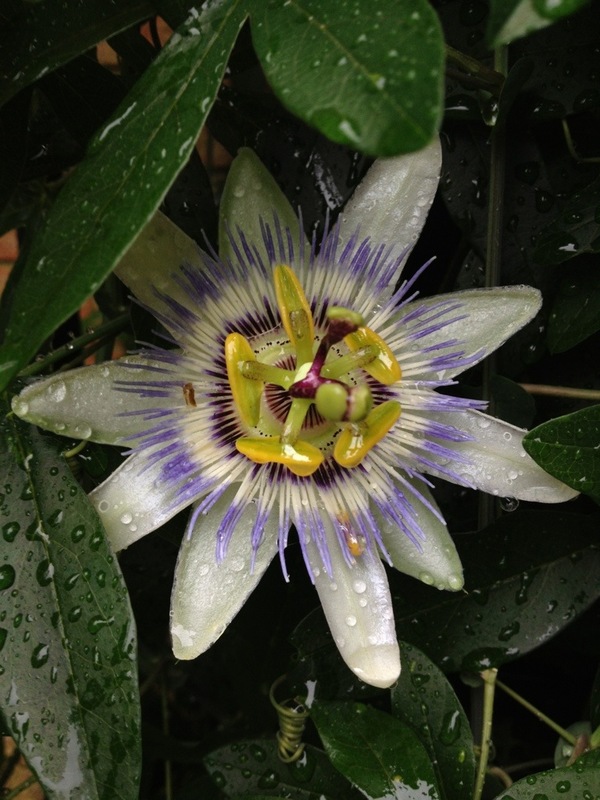 There are many plant with new blooms, too! And an unusual bicolor spiderwort. Once the sun come out and warms the ground, everything should begin a quick period of growth stimulated by the rain as we were in a very dry period before the storm. Glad you had no serious damage! Glad you didn’t see any serious flooding. 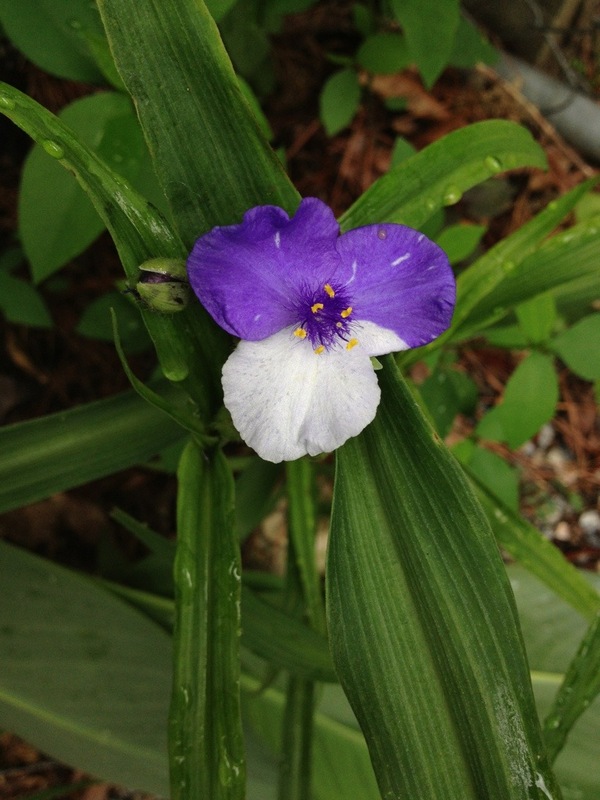 That tradescantia (spiderwort) is really unusual! I’m glad the storm wasn’t worse. 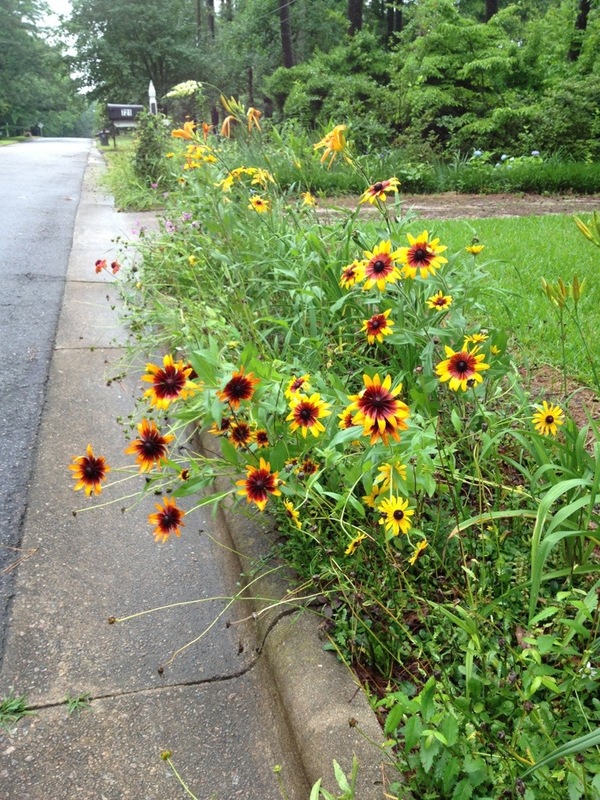 However, I really feel your pain about heavy rainfall wrecking the look of some favorite plants. Frequently they do recover, though. I miss the green you have there! 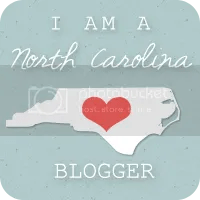 I lived in NC for part of a year and go back frequently to visit – it’s a big of a shock seeing all the green and wet in your garden and looking out my own window to the dry mountain sides! Glad everything made it at your house! Thanks! It’s so early most things will recover quickly!